When people come to church, they automatically leave all of their anger, rudeness and hostilities at the door. When you interact with people, there will be times when someone is rude...even at church. If a person is routinely rude outside the church, more than likely, they are going to be rude to you and other people at church as well. Typing this, I am reminded of the time I had to break up a fight in the church parking lot. Two cars had approached the same parking spot and neither wanted to let the other person have the spot. When we got to them, it escalated to the point where they were both out of their cars and yelling at each other. So what should we do when we encounter a "rude dude" or a "rude dudette?" Let's look at 7 steps for effectively dealing with rude people. Incorporating these won't eliminate rude dudes from being rude at your church, but they will help you know how to be classy in your dealing with it. Step 1 - Move away from the crowd and find a quieter place to dialogue. This can immediately help calm the person down and helps keep "damage control" to a minimum. You don't want the conversation to happen in a busy hallway where other people will see it. Step 2 - Act, don't react. This step is a must. If you don't get this one, you'll have a hard time helping rude people. You want to remain calm. Take a few seconds to gather your thoughts and take a deep breath. If you strike back in anger, it may reverse the situation and cause you to be seen as the aggressor. I know that's not easy, our natural tendency is strike back and "fight fire with fire." But pausing to respond and taking a few deep breathes can help deescalate the situation. And don't match their decibel level. Take the volume down by answering in a quieter, more respectful way. What if the attack happens by email or social media? What then? First, resist the temptation to strike back at them. Take some deep breaths. Go for a walk. Calm down. Gain some distance before you hit "send." And then respond by stating the facts, staying calm and showing you would like to resolve the situation. In most cases, it's better to answer by a phone call or even better yet, face-to-face. Answering on social media is usually not productive. Step 3 - Don't Take It Personally. I know that's not always easy to do. Especially when they are standing right in front of you. Yelling because they didn't get what they needed. They are usually angry at something that didn't even involve you. But you are standing in front of them, so you are the target of their anger. Don't take it personally. You just happened to be the person at the time that he or she could unload some frustration and anger on. Emotionally remove yourself from being the reason for the anger to being the person who is a sounding board for the person's anger. Often the person just wants to vent to someone. They want to be heard. Show them you are actively listening by keeping eye contact, nodding and then asking follow up questions that show you were listening. How can I help you resolve this? Step 5 - Be aware of what your body language is saying. Keep your arms unfolded. Maintain eye contact. Your posture should be welcoming. For your words to be effective, then they must match what you are saying through your body language. Even when it's not your fault. An apology is one of the quickest ways to slow down someone's rudeness. Step 7 - Solve the Problem. Ask the rude dude or dudette what a solution would be? This will give you a definitive answer to solve. Then work to solve the issue as quickly as possible. This will satisfy the rude dude while minimizing stress and hard feelings that can quickly rise in an emotional, volatile situation. It's easy to help a nice person. Anyone can do that. But it takes skill to connect with and help rude dudes. 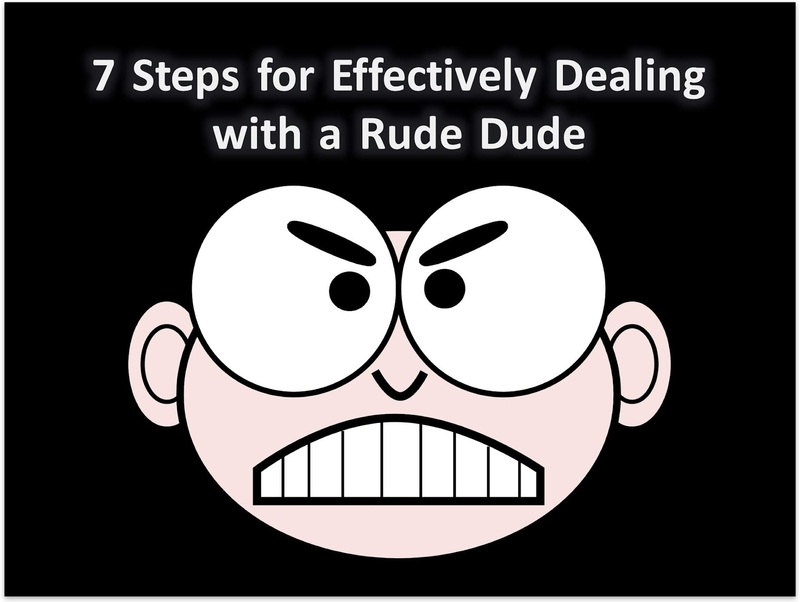 Bring these 7 steps into a rude dude or dudette situation will help replace anger with civility. Your turn. How do you deal with rude dudes? Share your comments and thoughts below. Great insight and very helpful.